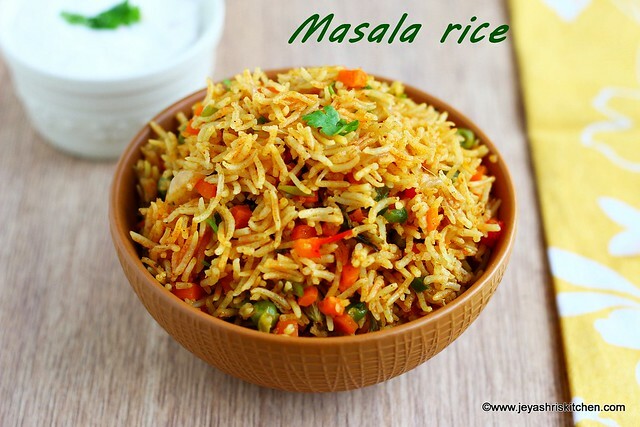 Masala rice | Vegetable pulao, is a simple and easy lunch box recipe. I made this for Sunday lunch and shared in Jeyashri's kitchen Instagram and mentioned that i will share the recipe of masala rice. Yesterday i made the masala rice and made a video of it too. 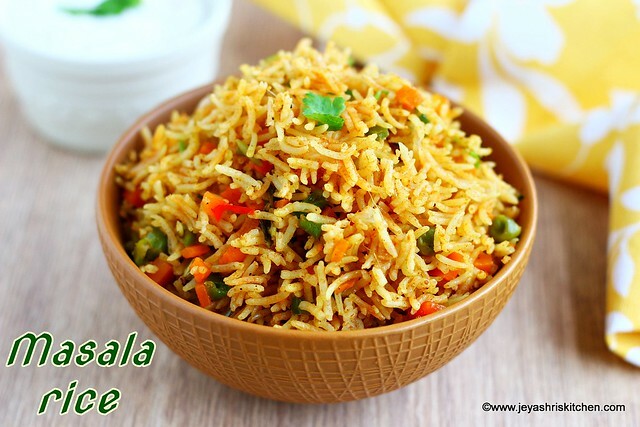 This is nothing but a simple Vegetable pulao recipe, with the addition of more Indian spices. It's very handy and a quick recipe and an easy one pot meal recipe. I have just given my style of making this and you can make your own variations to suit your taste buds. Wash the basmati rice and soak it for 20 minutes in 1 and 1/4 cups of water. In a pressure cooker, add ghee and 1 tblsp oil. Add bay leaf,cloves and cardamom. Add the ginger garlic paste. Saute for seconds. Add few chopped mint leaves to this. Add the carrot and green peas. I used frozen peas. Add the red chili powder, coriander powder,cumin powder,salt and garam masala. Add the soaked rice to this. Add the soaked water to this too. Mix and cover the cooker. Pressure cook for one whistle and simmer it for 5 minutes. Meanwhile in 2 tsp of oil saute the finely chopped capsicum. I used red and green bell peppers. Open the cooker and add the capsicum and chopped coriander leaves. You can add some chopped potato to the rice. Garam masala can be replaced by Biryani masala too.